ISO is an international standards organization headquartered in Geneva, Switzerland. ISO containers are produced in several standard configurations, including dry (or cube), insulated, flat rack (or platform), open top, refrigerated, and tank. Dry ISO containers are general purpose, totally enclosed, box type containers used for general purpose transportation. These containers are also called cube containers. Standard heights for dry containers are 8 feet 6 inches. Dry containers are also manufactured with extended heights of 9 feet 6 inches, and are referred to as high cube containers. Cargo is loaded from the end of the container. Insulated or thermal ISO containers are used to transport of chilled and frozen goods. 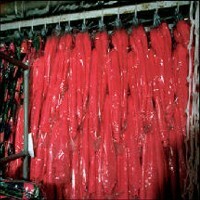 They are also used for temperature sensitive materials and products. The container walls are insulated, but the container does not have a refrigeration unit. Flat racks and platforms have no side walls, but may have end bulkheads. They are used to transport heavy machinery. Collapsible flat rack containers are open sided ISO containers with end bulkheads that can be folded down when the rack is empty. Open top ISO containers are box type containers with no top. These containers can be used to carry heavy, tall or hard to load cargo, and bulk material, such as coal or grain. Cargo can be loaded from the top or end of the container. Refrigerated, or reefer ISO containers are used to transport of chilled and frozen goods. They are also used for temperature sensitive materials and products where a steady temperature must be maintained during shipping. Tank ISO containers have a cylindrical tank mounted within a rectangular steel framework. These containers are built to the same standard dimensions as other ISO containers. They are used to transport liquid or bulk materials. 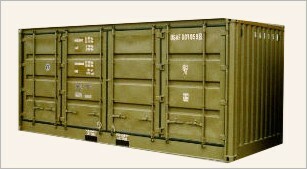 ISO containers are manufactured in standard sizes. The standard width of ISO containers is 8 feet, the standard heights are 8 feet 6 inches, and 9 feet 6 inches, and the most common lengths are 20 feet and 40 feet. Less common lengths include 24, 28, 44, 45, 46, 48, 53, and 56 feet. Although ISO set specifications for all parameters of the container, individual companies containers may depart from this in parameters other than dimensions. 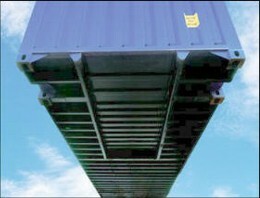 Dry, or standard containers are basically steel boxes, either 40' or 20' long, by 8' wide by 8'6'' high. Forklift pockets: these allow handling of empty containers with forklift trucks. Packed containers must not be picked up in this way unless specifically permitted. Forklift pockets are installed only in 20' containers and are arranged parallel to the center of the container in the bottom side rails. 40' containers do not have forklift pockets, since the pockets are relatively close together and such large containers would be difficult to balance. In addition, the forklift truck travel paths are often not wide enough. Gooseneck tunnel: Many 40' containers have a recess in the floor at the front end which serves to centre the containers on so-called gooseneck chassis. These recesses allow the containers to lie lower and therefore to be of taller construction. Grappler pockets: In general, containers are handled by top spreaders using the corner fittings or corner castings. However, some containers have grappler pockets for handling by means of grapplers. Clothes rails for hanging garments: Special lashing rings attached to the top side rail serve to accommodate clothes rails on which textiles may be transported hanging on clothes-hangers. These are often used in the East Asia import trade. Additional lashing rings are installed on the bottom side rail and the corner posts. Inlet (bulk bag or liquid bulk bag): Plastic liners may be suspended in standard containers for transporting bulk cargo or nonhazardous liquids. These come in many forms and materials for different types of cargo. The walls of hard-top containers are generally made of corrugated steel. The floor is made of wood. On the one hand, it is equipped with a removable steel roof. In some types, this roof has points for accommodating forklift trucks, allowing the roof to be lifted by forklift truck. The roof weighs approx. 450 kg. In addition, the door header may be swivelled out. These two structural features greatly simplify the process of packing and unpacking the container. In particular, it is very easy to pack and unpack the container from above or through the doors by crane or crab when the roof is open and the door header is swivelled out.In the case of transport of an overheight cargo, the container roof may be left open and fastened directly to a side wall on the inside of the container. To do this, the roof only needs approx. 13 cm (5 1/8") of space. Lashing rings, to which the cargo may be secured, are installed in the upper and lower side rails, the corner posts and the middle of the side walls. The lashing rings on the side rails and corner posts may take loads of up to 2000 kg. The lashing rings in the middle of the side walls may take loads of up to 500 kg, provided that the roof is closed. Usual hard-top container dimensions are 20' and 40'. Hard-top containers are used for all types general cargo (dry cargo). Their principal uses are for heavy cargo, tall cargo and loading from above or through the doors by crane or crab. A number of lashing rings, capable of bearing loads of at most 1000 kg, are mounted on the front top end rail and bottom cross member and the corner posts. Many 40' containers have a recess in the floor at the front end which serves to centre the containers on so-called gooseneck chassis. These recesses allow the containers to lie lower and therefore to be of taller construction. Open Top containers, are basically a dry container, with the roof removed. In place of the steel roof, is a tarp, which can be removed for loading or unloading the container from above (ie: a crane), or can be left open to accommodate cargo that is overheight. The walls of open-top containers are generally made of corrugated steel. The floor is made of wood. The roof consists of removable bows and a removable tarpaulin. The door header may be swivelled out. These two structural features greatly simplify the process of packing and unpacking the container. In particular, it is very easy to pack and unpack the container from above or through the doors by crane or crab when the roof is open and the door header is swivelled out. The purpose of the roof bows of an open-top container is not solely to support the tarpaulin but also to contribute to container stability. Flatracks are therefore more suitable for overheight cargoes. 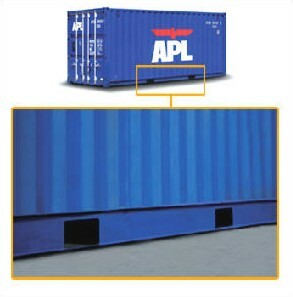 Lashing rings, to which the cargo may be secured, are installed in the upper and lower side rails and the corner posts. The lashing rings may take loads of up to 1,000 kg. Usual open-top container dimensions are 20' and 40'. Open-top containers are used for all types of general cargo (dry cargo). Their principal uses is forpacking and unpacking from above or through the doors by crane or crab and for tall cargo. Flatracks consist of a floor structure with a high loading capacity composed of a steel frame and a softwood floor and two end walls, which may either be fixed or collapsible. The end walls are stable enough to allow cargo securing means to be attached and several flatracks to be stacked on top of one another. Flatracks are available in 20' and 40' sizes. A number of lashing rings, to which the cargo may be secured, are installed in the side rails, the corner posts and the floor. The lashing rings may take loads of up to 2000 kg in the case of 20' flatracks or up to 4000 kg in the case of 40' flatracks. Some types of 20' flatracks have forklift pockets. 40' flatracks have gooseneck tunnels at each end. In addition, they are sometimes equipped with lashing winches with 2 metric ton lashing belts. For transport of certain cargoes, flatracks may be provided with stanchions. The maximum payload may be used only if the load is distributed evenly over the floor structure. If the weight of the cargo is applied to only a small proportion of the floor, it must be distributed and the manufacturer of the flatracks may have to be consulted on safety issues. Platforms consist solely of a floor structure with extremely high loading capacity; they have no side or end walls. This high loading capacity makes it possible to concentrate heavy weights on small areas. A platform consists of a steel frame and a wooden floor structure. Platforms are used principally for oversized and very heavy cargo.